This is a good problem for any NBA team to have. Brad Stevens has a lot of talent and terrific depth to work with, but how are all of these players going to be satisfied with their minutes? Quick math. There are five players on the floor at a time, and the game lasts 48 minutes - resulting in 240 player-minutes per game. I added up the average minutes-per-game of all 11 returning Celtics (excluding Gordon Hayward) and came up with 265 minutes/game. How can that be? Injuries would be the answer. Many of the Celtics missed a significant number of games, and thus the 265 minutes. Kyrie Irving, Al Horford, Jaylen Brown, Jayson Tatum and Marcus Smart all averaged 30 or more minutes per game. The projected starting unit may consist of Al, Kyrie, Gordon, Jaylen and Jayson. The second unit could be Aron Baynes, Marcus Smart, Terry Rozier, Daniel Theis and either Marcus Morris or Semi Ojeleye. Rounding out the 15 would be Guerschon Yabusele, Brad Wanamaker and rookie Robert Williams, plus whoever Danny Ainge picks to replace Abdel Nader who was recently waived. If the starting-five average 28 minutes/game, that leaves only 100 minutes for the rest of the crew. Inevitable injuries, unfortunately, will alleviate some of the crunch, as they did last season, and let's hope they are all minor. A closer look indicates Marcus Smart may not see much of a drop in minutes from his 30/game last season. Theis averaged 16 minutes last year before his injury, and he probably needs more playing time. Same for Semi (16 MPG) last season. If the improved offensive game during Summer League shows up in the early going of the regular season, his minutes need to increase. 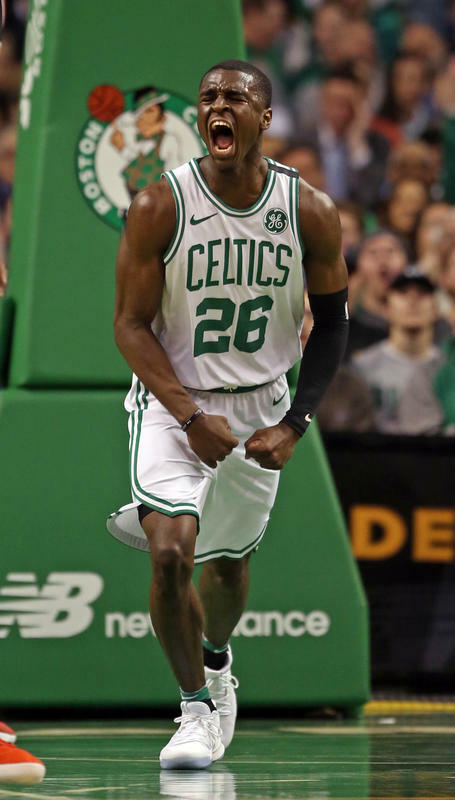 Yabu averaged seven MPG, and his minutes will probably stay in that vicinity, and G-League time may be in store for him again. The Golden State Warriors went with a deep rotation last year with 14 team members averaging double-digit minutes. The Celtics had 11 players in the 15-32 minute range, and the rest below 10 MPG. 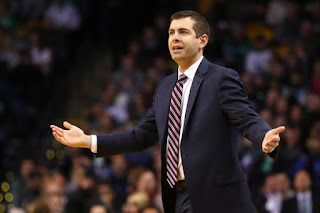 Brad Stevens likes to go deep so we may see 11-13 Celtics with 10 or more MPG. Marcus Morris and Terry Rozier are the unknowns here. T-Ro showed he can be a starter on a bad-to-mediocre team, but his minutes may dip below the 26 MPG from last year. Morris had 27 MPG last season, and he may be in for a drop in floor time also. Wanamaker wasn't brought in to keep the end of the bench warm, and Brad needs to see what he can do. Same with rookie Williams. The Celtics really need to see what he can do against NBA talent. We saw little of him in Summer League, but the above video shows that he moves very well on the floor for a big man. If he pans out, he would be just the type of player Boston needed, a center/forward with size and mobility that can defend, rebound and protect the rim while supplying adequate production on the offensive end. There are going to be some very talented Celtics players getting limited minutes, and now we come to the open 15th slot. Will it be Jabari Bird? That could happen, and what if his defense raises to the level of his offensive game during the course of the season. The Celtics are only slightly over the luxury tax line and may try to squeeze under it via a move or two. The roster is not fixed - not yet. What a problem to have - too much talent and too much depth. But I doubt there is such a thing.